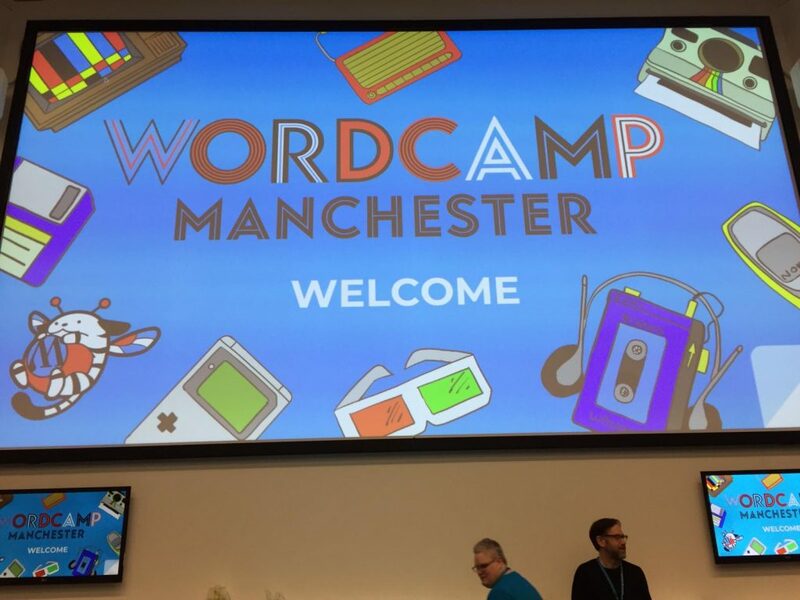 A couple of weekends ago (27th November 2018) Woody and I attended WordCamp Manchester, which is in my home town. This blog post covers our take on the event, which talks we attended and whether as Entrepreneur’s who use WordPress whether attending these type of events are worth the time. WordCamps are annual meetups for people in the WordPress Community. That’s people who either use WordPress, develop for WordPress or help design for clients who use WordPress too. The first talk of the day. This was a very interesting talk on the importance of design patterns in the scope of large projects (like WordPress). A story of how often designers are consulted last on a project and how developers outweigh designers massively on any large WordPress piece of work. This was Woody’s favourite talk, having suffered with burnout (from project-overload as a self-employed programmer/entrepreneur/author). Dan walked through his story, which is close to my own, where by the pressures of self-employment, remote working, and life-behind-a-screen built into a problem. He then moved on to discuss his work at a solution: WP and Up. WP and up is an organisation seeking to support WordPress developers & entrepreneurs, and that is a cause we should all get behind. It is easy to feel alienated, alone, and overwhelmed, and giving support to those of us who need it in their darker times is a valiant and necessary pursuit. I (Woody) will be reaching out to Dan to reconnect after this talk, and suggest we all support WP and Up in whatever way we can. This talk looked at how you’d start planning content for your website and ways to rank for specific long tail keywords. It was useful if you were trying to build a website. However it stopped short of what to do if you were targeting the bigger keywords (like CRM). It focused on writing for your own site, linking to your own posts and continuing to write very specific pieces of content in the aim to get search traffic for very specific phrases (e.g. WordPress login form is not showing secure in google chrome) and targeting an article on that. This was a useful talk for bloggers. This was a good talk and quite frankly it was an area neither of us have really considered with any website builds. It went through how a blind person interacts with a website using a screen reader, and how little things (like an auto-playing video) really makes a website horrendous for impaired visitors. So what, you may say, but with 1 in 5 people having some sort of impairment (visual, attentive, colourblindness) it can really impact your revenue if a website isn’t accessible (if you’re selling crm extensions). This was a great talk about Gutenberg, giving a spot light on “repeatable blocks” which are more like a visual “short-code” which are easily setup and easily used in other content. Magical. Gutenberg and Blocks does make a lot of sense when writing content and it will really change the way WordPress is used as a blogging tool. We will be exploring the methodology behind Gutenberg Blocks where it makes sense in ZBS CRM, in the near future. How best to say NO and also how best to refuse them if the work really isn’t in your area of expertise. This was our least favourite talk of the day. I think probably due to expectations more than anything else. I was expecting it to cover things like how to contribute to the WP core, trac.wordpress.org etc and make.wordpress.org. The best way to get involved, which issues to tackle first etc. But instead it covered how releasing a free product is contributing to WordPress (which is sort of is) but we do that with our free Core of Zero BS CRM. A pleasant talk however, from a very nice chap and it’s encouraging to see other Entrepreneur’s doing great things to help them build their own business. Year 0 – initial development, rapid prototype of v0.1 using WP functions, WP databases etc. Year 1 – Initial move over of the contacts (main data object) to specific DB tables. Year 2 – further refinement of the database model for more complex queries. (the run up to v3.0) further migration of the database for all objects and linkages. It was interesting to hear how WP can be used for wider projects for clients too. Mike is a strong advocate of using WP to quickly build out MMP projects and has done this himself on various occasions. We share his love of rapid development, and have used many similar approaches in the past. The pitfall, or darkside of this is…. quite nicely covered in the next talk. This was Mike’s favourite session of the meet-up (again, following listening to Tim at another talk). Tim covered security and WordPress. When websites get more and more plugins installed, the chance of an issue in one leaves your whole site exposed to nasties. When using WP for a project, it’s always advisable to use the fewest plugins possible and a solid theme (not too custom, unless you know the developer of the theme is a solid developer). Further, to keep everything up to date ASAP. We recommend ‘Limit Login attempts’ and WordFence for added security. The talk covered some exploits in the wild (i.e. revolution slider) which allowed users to register themselves as an admin, then other plugins on the site (e.g. WP SMTP) which had email credentials for sending emails, and even other FTP type plugins which had those types of data stored too. Left unchecked it means your site could easily be a target for those malicious actors out there. 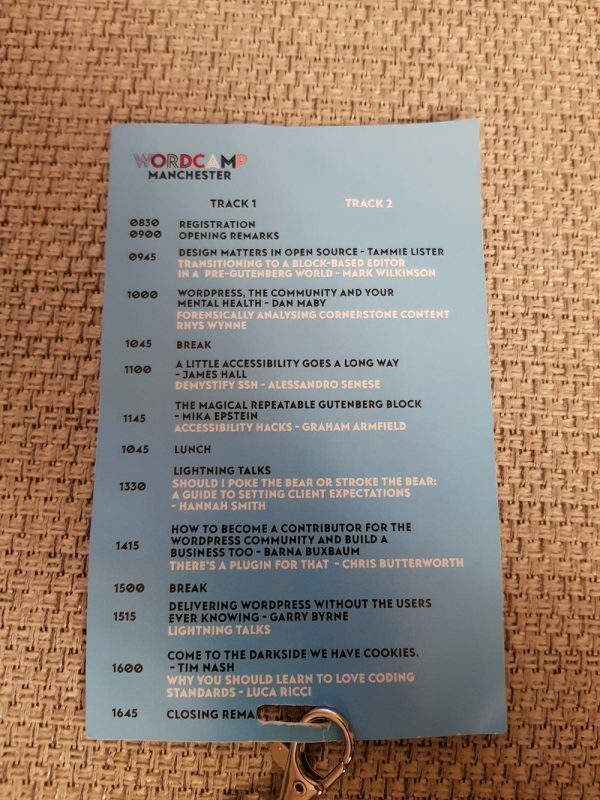 All in all a great day with a good range of talks covering WordPress and it’s lovely ecosystem. We’re happy we attended and look forward to spending more time at future WordCamps.